Our product range includes a wide range of protective exterior acrylic paint, solar heat reflective coat and uv resistance pu coating. More efficient and comfortable staff. Saves energy, Reduces cost of Air Conditioning. Provides longer life to structural surfaces, highly cost effective. In concrete Less stress cracking. Suitable for roofs & walls. Most effective in Indian & tropical climatic conditions. Cost recovery by energy savings in less than 18 months. 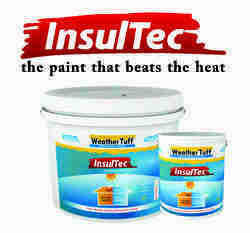 InsulTec can be tinted with light pastel shades, however we recommend it to be used as it is. Solar Heat Reflective Coat (ECO Kool Home) white membranous paint. When applied to the exterior surfaces, stops the solar heat transfer and keeps the interior cool. ECO Kool Home when applied to the external sun exposed surface of a building, it re-radiates the solar Rays & UV Rays back in to the atmosphere. 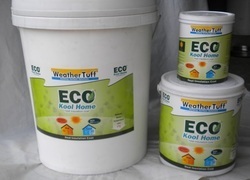 So it reduces room temperature up to 7 Degree C. The formulation of ECO Kool Home is unique. It is a water based co-polymer compound. It is a one component system with excellent adhesion, micro porous, impervious to salt spray & air born pollution, mould & fungus resistant. Surface Preparation: Clean surface with water. Make surface dust & grease free; remove all previous coating, which may have loose bond with the surface. Primer Coat: If surface is permeable or porous apply one coat of diluted ECO Cool Home with 1:1 proportion of water or any primer as an undercoat. In case of a surface with prominent suface cracks, fill up these surface cracks with diamond shield or any good quality crack filler before applying ECO Kool Home. First and second coat: ECO Kool Home can be applied by brush, roller or spray. Apply two coats of ECO Kool Home after diluting it with 10% water. Keep an interval of 3-4 hrs between each coat. For Galvanize Sheet/Metal Surfaces : Clean the surface and make it dust, grease & oil free and then apply a coat of Zine Primer to avoid corrosion of the metal sheet. First and second coat: On primed metal surface apply two coats of ECO Kool Home by diluting it with 10% water. Keep at least 4 hrs interval between two coats. Glaze coat: To avoid accumulation of dust one can also one coat of glaze coat for protection & long lasting, maintenance free surface finish. Galvanized sheets, Asbestors sheets or any metal surfaces. It can be tinted with light pastel shades. However we recommend to be used in its natural color. Since our commencement, our firm is engaged to introduce a premium quality array of UV Resistance Coating. The offered coat forms a film on the surface after drying to bridge small hairline cracks and to make waterproof to substrates. This is used in exterior walls, RCC surface, asbestos sheets, and slopping roof, brick walls. Apart from this, clients can get the coat from us at reasonable rates. For pencil hard scratch resistance, water resistance, UV resistance, Fast dry and abrasion resistance. Water based clear matt top coat for flexible, yet, total Dust Resistance and 60% to 70% Gloss. On primed concrete, PU & Epoxy self levelling floor and as top coat to 'ANY FINISHED PAINT' as best protective coat,as it increases the life of coat for minimum 5 yrs. Single coat application on any painted surface for all weather protection. Clean the sur ace thoroughly & make it ree rom loose dust & oil. Wash the surface with water. 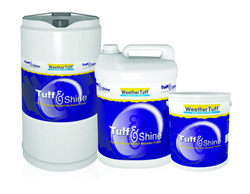 Apply the first coat of TUFF & SHINE COAT by brush or spray. If necessary two successive coats.